Flood waters are receding, winds are subsiding, and rain is tapering off. I promised you a "nasty" day from this powerful coastal storm, and Mother Nature certainly delivered. During the peak of the storm Saturday morning, conditions ranged from "yucky" in North Jersey to downright "scary" along the Jersey Shore. This is a "by-the-numbers" review of "The Nor'easter of October 2018". Just keep in mind that while the wind speeds, flood crests, and rainfall totals are compiled from trusted, official sources, they are generally preliminary and unconfirmed. Thanks to all who shared photos and videos with us! Keep 'em coming - best way to submit is on Facebook, Twitter, or via the NJ101.5 app! I only start with this point because I can already hear the internet trolls complaining that the storm "wasn't so bad" and "obviously wasn't a nor'easter"... Of course it was. 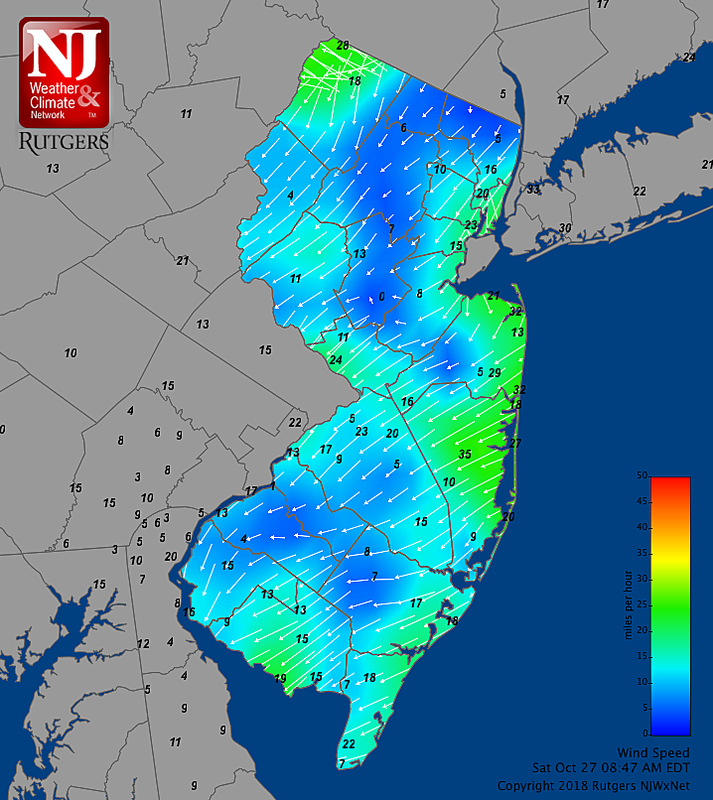 Here's a map of wind speed and direction from the NJ Weather & Climate Network during the peak of the storm. Classic northeasterly winds. A classic early season nor'easter. I said the wind and surf would be our major concerns, and I think that statement verified perfectly (especially along the Jersey Shore). Scattered power outages, downed trees, and displaced Halloween decorations. The overall wind gust winner was 67 mph, reported 3 miles south of Seaside Park at 8:44 a.m. 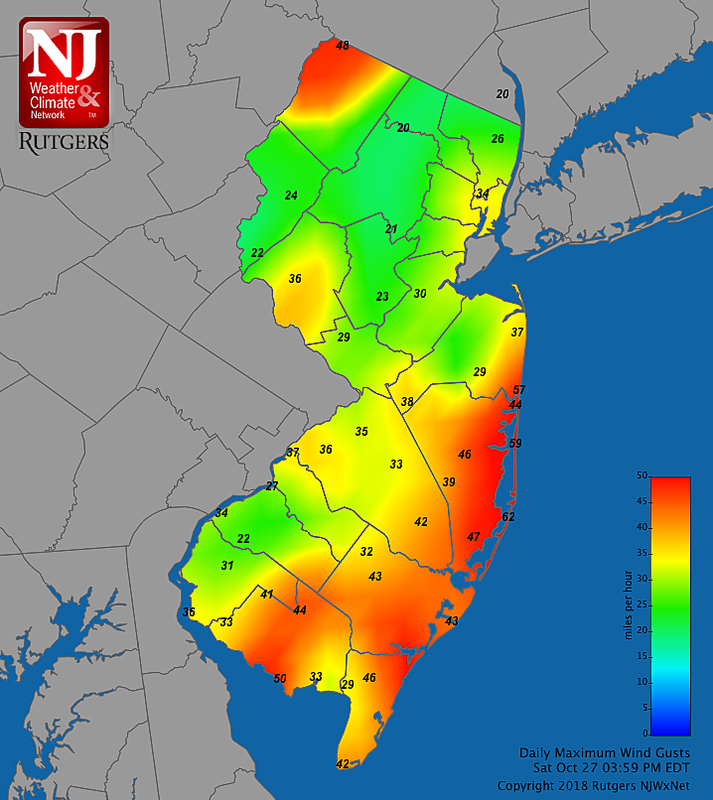 There were several 60+ mph gusts along coastal Ocean County. Those ferocious east-northwest winds drove a lot of surf and ocean water toward the coast Saturday morning. For some tide gauges along the Jersey Shore, this ranked among the top flood events on record — behind a couple of storms you may be familiar with, named Irene and Sandy. 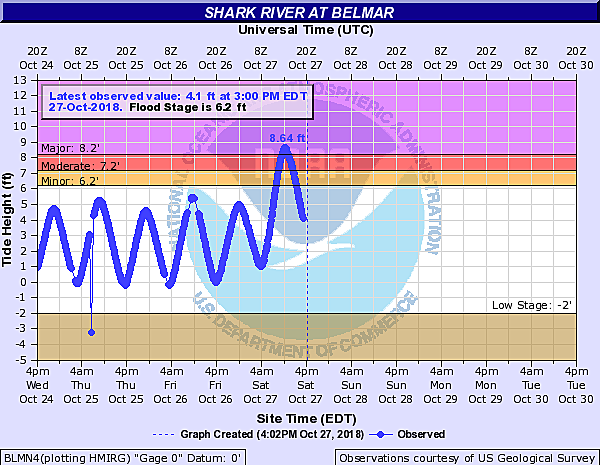 Along the Shark River in Belmar (the gauge is right under to the Route 35 bridge), the Shark River crested at 8.64 feet. That ranks as the third highest on record — above every wintertime nor'easter in 2016, 2017, and 2018, but below Tropical Storm Irene (8.91 feet) and Sandy (13.51 feet). Watson Creek at Manasquan recorded its fourth highest crest at 7.81 feet, behind Irene (8.27 feet), a storm in the December 1992 (9.38 feet), and Sandy (12.32 feet). Little Egg Inlet at Tuckerton will also place this storm (6.77 feet) in third place in the record books, behind the Blizzard of 2016 (6.97 feet) and Sandy (10.31 feet). 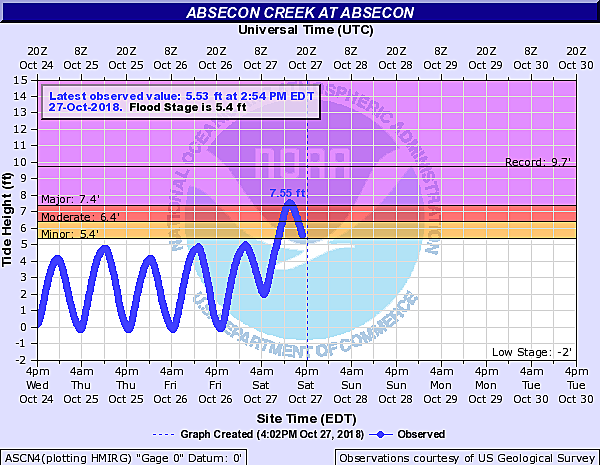 A few miles inland along the Absecon Creek in Absecon, the measured high tide level of 7.55 feet was only exceeded by Sandy (9.72). Along the beach in Margate, the tide crest of 7.65 feet falls behind only Sandy (10.43 feet) and a storm in March 1962 (12.13 feet). I think it's clear that, while the surge and coastal flooding from "The Nor'easter of October 2018" was impressive and historic, it was nowhere near as catastrophic as that of Superstorm Sandy. The ultimate example is Sandy Hook. Saturday morning, the Sandy Hook gauge peaked in the major flood category at 8.77 feet, about 3 feet higher than the previous day's high tide levels. Sandy crested at 14.40 feet on October 29, 2012. And that the last measurement recorded before the gauge broke. Even though floodwaters are generally receding, be sure to obey any road closures that may still be out there. It may take a few more hours (or even days) for all the water to return to the sea. As we discussed in the days leading up to this coastal storm, heavy rain was likely but not our largest concern. The flash flooding threat was mitigated by our recent stretch of dry weather and a relatively dry ground. Some locations overperformed and some underperformed the general "inch or two" rainfall forecast. 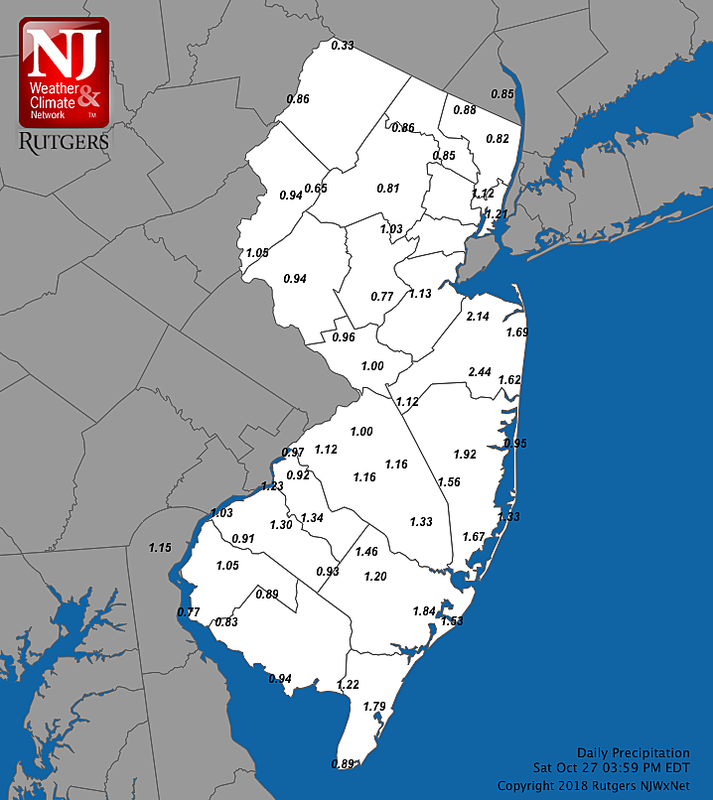 The heaviest rain totals topped 2 inches, especially around Atlantic and Cape counties. While the rain made for a nasty damp day, it was clearly the least of our meteorological worries. --Egg Harbor Township (Atlantic)... 2.42"
--Atlantic City International Airport (Atlantic)... 2.33"
--Cape May Courthouse (Cape May)... 2.33"
--North Cape May (Cape May)... 2.30"
--Green Creek (Cape May)... 2.20"
--Middle Township (Cape May)... 2.15"
--Dennis Township (Cape May)... 2.03"
The least amount of rain in New Jersey fell along the tippity-top of the state. Just 0.33" was recorded at High Point Monument (Sussex) and 0.65" at Hackettstown (Warren). The only tidal flooding threat that remains this evening is along the Delaware River which, as of this writing, is still rising slowly. A Coastal Flood Advisory remains in effect from Trenton to the Commodore Barry Bridge until 6 p.m. Saturday. 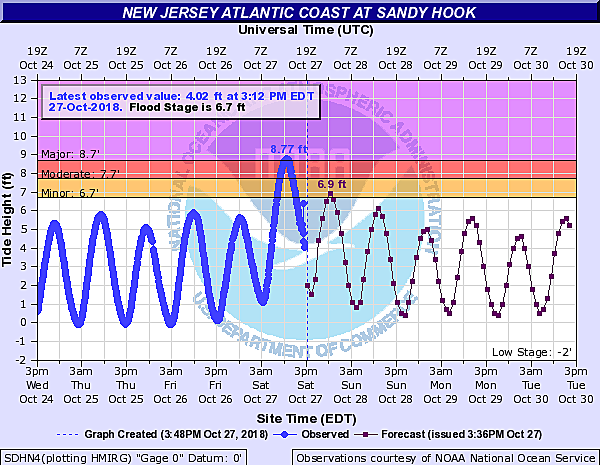 Along the Atlantic Ocean, the next high tide is expected around 10 p.m. Saturday night. It is expected to be much closer to a normal tide level, with minimal flooding concerns along the oceanfront, back bays, and tributaries. Out of an abundance of caution, and especially because the back bays are still running high, a Coastal Flood Advisory has been issued from 9 p.m. Saturday to 3 a.m. Sunday for the risk of minor flooding. A Coastal Flood Advisory continues for the Delaware River until 6pm and the northern Jersey Shore from 9pm to 3am. The worst wind and rain are firmly behind us, with our weather continuing to improve as night falls. It may still be breezy (20 mph) through this evening, and I wouldn't rule out some drizzle until just after Midnight. After such a dramatic weather day, I'm happy to say that the forecast for Sunday still looks great! We'll enjoy breaks of sun throughout the day with a light breeze. Models have come down on the high temperature a forecast a little — we'll be around 40 degrees Sunday morning and 55 degrees Sunday afternoon (5 to 10 degrees below normal for late October). New Jersey's next chance for rain will be Sunday evening through Monday morning. Just a bit of rain — no flooding or wind concerns, I'm happy to say. This concludes our nonstop nor'easter storm coverage. Special thanks to our news, traffic, digital, and programming teams for their diligence and assistance throughout this crazy, busy week. Enjoy the rest of your weekend, New Jersey!